Changing the gears in your car wouldn’t be possible without help from the transmission. Whether you have an automatic transmission or a manual transmission, the certified technicians at TransMedics can help maintain it through our incredible range of transmission services. For years now, TransMedics has been Raleigh, NC’s premier source for tires, brakes, auto repairs, maintenance and more — but our true specialty, and what we started out in, is transmissions. Check your transmission fluid on a routine basis and refer to your vehicle’s Owner’s Manual for the manufacturer’s preferred service interval. How do I know if my transmission fluid is dirty? Clean transmission fluid is bright red in color. If the coloration is off, it might be time to schedule an appointment with our specialists. How do I know if my transmission is bad? Just because the “check engine” light has turned on, it doesn’t mean your transmission has malfunctioned. It’s best to reach out to TransMedics for a free diagnostic. Call (919) 954-8699 for details. 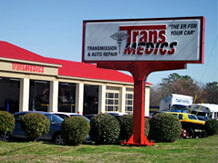 Visit TransMedics at our auto shop location in North Raleigh. We serve clients from all over the Triangle, including Wake Forest, Rolesville, Knightdale, Durham and Cary.